A number of teams playing on Wild-Card weekend have a legitimate chance at a title run. The Steelers might be the best team in the AFC. They’re playing a Bengals team that won 12 games. The Texans and Chiefs have combined to win 16 of their last 18, with the Chiefs winning 10 straight after a 1-5 start. In the NFC, the Seahawks look as good, if not better, than they have upon entering the postseason the past two years. The Vikings just went into Lambeau and took a division title from Green Bay. Washington comes in having won four straight, the last three convincingly. And the Packers, well, they’ve been mostly awful since October, but they’re quarterbacked by Aaron Rodgers. A deep run from them would not be the most shocking thing. As great as these teams look, four won’t even make it through this weekend. The NFL is about matchups, so, let’s break down the intricacies of these Wild Card matchups. The Texans have allowed an average of just 12.7 points in their last nine outings for two reasons. One is they have a dynamic, dominant front that’s highly interchangeable. It’s more than just J.J. Watt, who continues to play beyond a Hall of Fame level. Whitney Mercilus has emerged as a proficient rusher, particularly inside, either off of stunts or from a standup nose tackle position along a five-man front—something the Texans feature regularly in order to create one-on-one scenarios. Then there’s Jadeveon Clowney. Athletic stiffness prevents him from being an elite pass rusher, which demands that you bend around the edge. But Clowney is still very explosive, especially in his second step. Coupled with long arms and raw strength, he’s become an important bull-rusher and setup man on stunts and twists. Mercilus, Clowney, the improving John Simon and, of course, Watt, line up in all different places along Houston’s fronts. • BONE-CRUSHING HITS AND A BEAUTIFUL MIND: In the mold of Lawrence Taylor, the Texans’ J.J. Watt is redefining how defense is played in the NFL. The second reason for Houston’s success is its secondary’s proficiency in Quarters coverage. That may seem awfully specific, but Quarters is this team’s foundation. In that approach, each of the back four defenders plays zone along one-fourth of the field. After a downfield receiver passes the linebacker level, the zone defender in that one-fourth area converts his coverage into man. In many respects, Quarters is the best of all worlds because defenders can have eyes on the quarterback yet still be aggressive against his targets. The reason more teams don’t play it is they don’t have Watt, who allows a defense to stop the run without dropping one of their two safeties in the box. • WATCH: Peter King’s Chiefs playoff preview. The catch for this matchup: No offense is better at designing plays to exploit specific coverages than Kansas City’s. If Andy Reid and Alex Smith know what you’re going to play, you’re in trouble. The saving grace for Houston is that Kansas City’s O-line is fragile on the right side, where Watt usually aligns. The Chiefs will out-leverage the Texans via play design a few times, but the Texans, being more talented, will often out-execute them. • HOW ALEX SMITH AND THE CHIEFS TURNED A SEASON AROUND: Andy Reid decided to put a little more trust in their quarterback’s football mind. The reward: a 10-game winning streak. Kansas City’s defense has been almost as good as Houston’s, allowing 12.8 points an outing during the team’s 10-game winning streak. They’ve also forced 23 turnovers in that span, many of which have put their so-so offense in easy position to score. The Chiefs do it primarily through man-to-man and with a pass rush that, with both Tamba Hali and Justin Houston now likely to be healthy (plus ascending second-year pro Dee Ford a greater part of the rotation), is capable of generating pressure without the help of blitz. That isn’t to say coordinator Bob Sutton won’t call for designer pressure. It’s one of his favorite things, and because the Chiefs often play out of dime, with six defensive backs on the field, Sutton’s blitzers can come from greater, more disguised depth and with speed that pass-blockers aren’t accustomed to seeing. 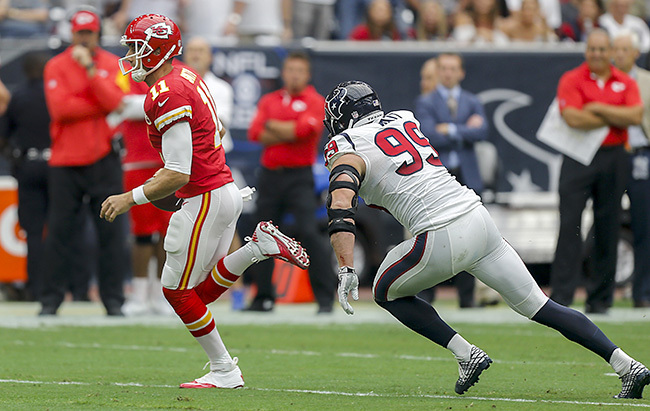 • WATCH: Peter King’s Texans playoff preview. All this in mind, the Texans will want to play quick, both before the snap via no-huddle and after it via three-step timing throws. Expect to see man-beater route designs such as wide receiver stacks, tight bunches and shallow crossing patterns. The Texans will be able to dictate matchups for the nearly unguardable DeAndre Hopkins, too. The Chiefs are excellent at cornerback, but rookie Marcus Peters and veteran Sean Smith rarely change sides. Peters guards the receiver aligned on the defense’s left, Smith takes the right. In the slot is Ron Parker, an up-and-down veteran who can be attacked with out-routes. That’s what you’ll see Hopkins run most often. If Kansas City can keep him under 125 yards, they’ll be in great shape. The belief here is that Pittsburgh is the most dangerous of the six teams entering this year’s AFC bracket. The Bengals had the league’s No. 2 scoring defense this season but allowed 26 points last time they faced the Steelers (Pittsburgh added a pick-six in a 33-20 win). In that game, they were beaten repeatedly by receivers on individual routes, regardless if the coverage was man or zone. Ben Roethlisberger completed 17 of his first 20 passes. • ROETHLISBERGER TAKES OVER: The Steelers signal-caller has become the NFL’s most physically gifted QB. When the Bengals are at their best is when they’re in a straight Cover 2, relying on a four-man rush. No defense blitzed less often than this one in 2015. To contain Roethlisberger and his high-flying targets, defensive ends Carlos Dunlap and Michael Johnson, plus tackle Geno Atkins, will have to get quick penetration. It’s always a toss-up whether they will. Few defensive lines are as talented as this one, but few are as inconsistent. And if the Steelers have early success out of their spread formations, where Roethlisberger is likely to get the ball out quickly, it won’t matter how well the pass rushers perform. This means it’s on Cincy’s linebackers and corners to win with physicality. You can’t give Antonio Brown and Martavis Bryant space off the line of scrimmage—they’re too shifty. The benefit of playing Cover 2 is you always have a safety over the top, giving corners more margin for error out of press position. Adam Jones (who did not play in the last meeting) and Dre Kirkpatrick must take advantage of that. 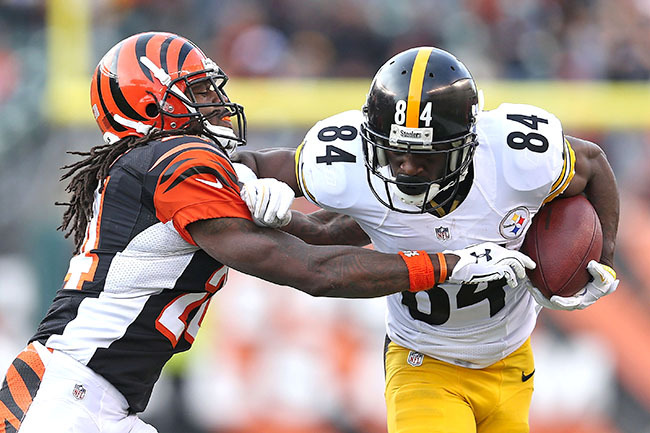 • WATCH: Peter King’s Bengals playoff preview. The Bengals are capable of competing here. In fact, they did in these teams’ first meeting back in Week 8 (Cincy won 16-10). Reggie Nelson and George Iloka were rangy and heady in deep coverage that day, which took away throws and resulted in turnovers. Three of Nelson’s league-leading eight interceptions this year came against Roethlisberger; two were in this first game. Roethlisberger was still working his way off a knee injury that day. He appears much healthier now. Pittsburgh’s offense is just too explosive. • NOBODY WANTS TO PLAY THE STEELERS: An explosive downfield passing game and a creative defense make Pittsburgh the most dangerous team in the AFC bracket. Last time these teams met, defensive end Stephon Tuitt brilliantly read an inside screen to Giovani Bernard and saved a touchdown by intercepting it. Andy Dalton broke his thumb tackling Tuitt on the runback. AJ McCarron came in, had some highs but more impactful lows (most notably on a pick-six to William Gay in which McCarron diagnosed man coverage before the snap and the Steelers switched to Cover 2 after it). • WATCHING FILM WITH … A.J. GREEN: Green breaks down the nuances of his game, his chemistry with Andy Dalton, and how he got the best of the Steelers last season. Regardless if it’s McCarron or Dalton, the Bengals try to win through formation variation, mismatches created by pre-snap shifts, and downfield route combinations that take advantage of A.J. Green or, in the red zone, tight end Tyler Eifert along the seams. The Steelers try to win with stingy run D and disguised blitzes and coverage rotations on third-and-long. They present a lot for a QB to overcome, especially if that QB is making just his fourth career start or coming back from a month-long injury to his throwing thumb. • WATCH: Peter King’s Steelers playoff preview. And so staying out of third-and-long takes on added importance for the Bengals. That means running back Jeremy Hill must rediscover his vision and downhill aggression. Hill had 96 yards on 16 carries last week against Baltimore, but his greater body of work in 2015 is unattractive. Giovani Bernard has been the better runner and is more appetizing in the passing game. He could very well see 20-plus touches Saturday night. Another factor to consider: The Bengals have a good run-blocking front, but they could be without terrific lead-blocking H-back Ryan Hewitt, who injured his knee in Week 16. They’ve moved nimble rookie offensive tackle Jake Fisher into Hewitt’s spot. Fisher looked okay on 23 snaps against the Ravens but does not have Hewitt’s athleticism. Pittsburgh’s run defense has been quietly been stingy this season. In five of Russell Wilson’s last six games, he’s been a sterling pocket passer. This is not unlike DeAndre Jordan suddenly becoming an 80 percent free throw shooter. Wilson, like Jordan for the Clippers, is a uniquely gifted specimen who does a lot of unconventional miscellaneous things to help others prosper. But when it comes to operating within the confines of a traditional approach, he has limitations to overcome. The most conspicuous being that, at barely 5-foot-11, he doesn’t always see clearly from the pocket. • HOW RUSSELL WILSON TORE APART THE STEELERS: With Jimmy Graham going down with an injury, the Seahawks turned to a spread offense and moved the ball at will. The second game of Wilson’s unlikely late-season surge was in a Week 13 blowout win at Minnesota. That day, Seattle spread out and put Wilson on the move. This ameliorates his vision issues, making him a more comfortable quarterback. The Seahawks lately have also gone with more specific coverage-beating route combinations, which is why you’ve seen an influx of pick routes and downfield switch releases (i.e. receivers crossing each other’s lanes). Schematically, this is the best that Seattle’s offense has looked under coordinator Darrell Bevell. And now it’s an offense that gets star running back Marshawn Lynch back. Who knows how Lynch will be coming off the first surgery of his life. If Vikings nose tackle Linval Joseph is healthy (he’s missed four of the last five games with a foot injury, including the Week 17 Sunday nighter), the Vikings are extremely tough to run against. 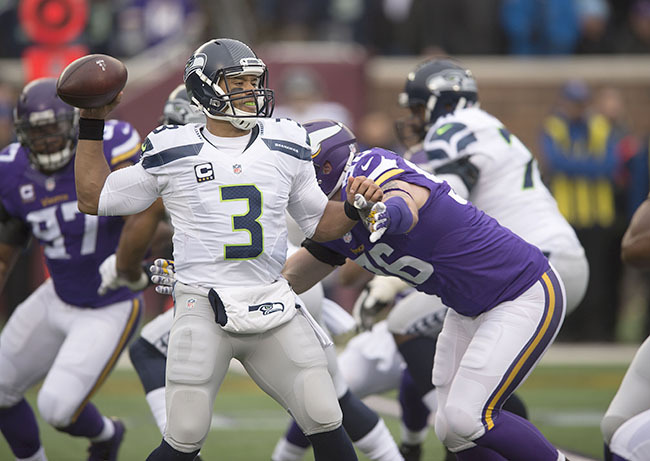 • WATCH: Peter King’s Seahawks playoff preview. Vikings head coach Mike Zimmer loves to bring pressure, especially through the A-gaps (between the center and guard). But that approach can leave you susceptible to Wilson’s scrambling should he escape the pocket. Given that Seattle’s O-line is, to put it kindly, nothing special, and Minnesota has firepower on the edges in Everson Griffen, Brian Robison and, in nickel, Danielle Hunter, don’t be surprised if the Vikings rush four and sit back in zone coverage. Evaluating these units’ last matchup is almost pointless because the score coerced the Vikings into abandoning the run. That’s the opposite of how they’re built to play. Even if the Vikings get down early again, expect Adrian Peterson to be featured. It becomes more apparent each week that Teddy Bridgewater has arm strength limitations. The Vikings have become one of the least vertical offenses in football, which is saying something considering that coordinator Norv Turner has long been one of the game’s most downfield-oriented play-callers and designers. • WATCH: Peter King’s Vikings playoff preview. The only way Minnesota can stretch the field in this game is with play-action, which means taking calculated deep shots on first down out of running formations. Their O-line cannot handle Seattle’s torrid front four on a straight five- or seven-step dropback. And, aside from Stefon Diggs, who has run hot and cold the past two months, the Vikings don’t have any receivers capable of out-jostling a Seahawks secondary that’s finally found its identity thanks to corner Jeremy Lane’s return and nickel man DeShawn Shead’s emergence. This game will come down to how productive Adrian Peterson can be on what should at least—at least—be 25 touches. Peterson is one great player. The defense he’s facing has about eight. The reason the Packers have lost six of their last 10 (and it would be seven if not for a Hail Mary) is their receivers cannot get open against man coverage. It’s that simple. Or, it was, anyway. As the disorder against man coverage has manifested, the rest of the offense has become infected as well. That includes Aaron Rodgers. He’s playing arguably the worst he’s played since his first season as a starter. What few throws that are breaking open are being left on the field, as Rodgers now routinely plays out of rhythm, looking to go off script. You can’t sustain offensive success that way; the fact that one of the most gifted quarterbacks of all-time has an 81.9 passer rating and is averaging under 6 yards per attempt over last 10 games proves it. • AARON RODGERS ‘DESPERATELY WANTS TO BE COACHED’: A need to avoid turnovers has been drilled into Aaron Rodgers dating back to a quarterback competition in eighth grade. 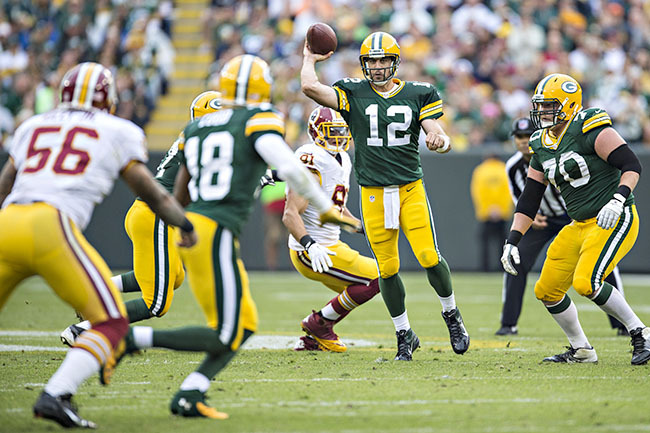 • WATCH: Peter King’s Packers playoff preview. The Packers have been utterly inept against man coverage all season long, including during their 6-0 start, which was nowhere near as impressive as people are now making it out to be. But here’s the tricky part: Washington is one of the more zone-oriented defenses in the league. New D coordinator Joe Barry simplified everything, making this a straight Cover 3/Cover 2 unit. Lately, he’s mixed in a few more man-to-man concepts, with decent success, but not enough to redefine the group’s makeup. And so the question becomes: Will Washington stick with what they do best and play zone? Or will they try to make the Packers do what they do worst, which is beat man-to-man? We’ve asked this very question with other zone-based defenses who’ve faced the Packers. Almost all of them, including the Vikings, Raiders, Lions and Panthers, strayed from their zones and played more man. Kirk Cousins is not a superstar, lately he’s just posted the statistics of one. To some, that’s enough. Packers defensive coordinator Dom Capers won’t see it this way, though. Capers knows that it’s not Cousins he must stop, it’s Cousins’ weapons. Take away those and Washington’s offense crumbles. Cousins is not a QB who makes others better; he’s just emerging as a really good game manager. • THE BOOKS OF COUSINS: The starting quarterback for the surprise NFC East champs is on a constant quest to better himself as a player and person. People always find this sort of assessment insulting. Game manager has become a pejorative term. But those inside football don’t necessarily agree. They understand that with good coaching and fundamental play, you can win with a game manager as long as he, you know, manages the game well. Hats off to Cousins; he’s been stellar in this sense. It helps that he plays in a brilliantly designed offense. Jay Gruden and his staff have been as good as any when it comes to constructing plays that naturally defeat a defense’s core principles. With tight end Jordan Reed and wideout DeSean Jackson both healthy, they have the weapons to do whatever they can imagine. Reed is a flexible matchup nightmare. Jackson has speed to burn. Washington often smartly puts these two on the same side of the formation, forcing a defense to either tip its hand or declare where its help coverages are going and, likely, defend one of the two stars one-on-one. • WATCH: Peter King’s Washington playoff preview. Green Bay’s is a difficult defense to manipulate. They’re as versatile in terms of scheme and personnel as any in the league. That versatility extends to man coverage, which is the best way to combat a team that beats you through play design. (Though of course there are play designs that naturally beat man coverage.) A lot will be decided by whose terms this game is played on. If it’s third-and-long, the game is on Green Bay’s terms. If it’s third-and-medium or less, it’s Washington’s terms. And so it comes down to Washington’s zone ground game vs. Green Bay’s amorphous front seven.